Today (March 31) is data capture day, however in exception to my usual practice, release will be delayed until next week. This step is meant to help me, and everyone else, fully participate in Earth Hour. Elsevier Cell Reports OA: confused or fake? Update: a closer look suggests genuine confusion. 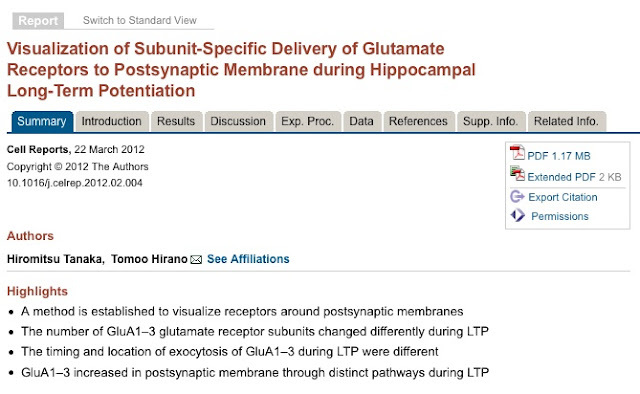 When I click on the most recent article in Cell Reports, the following picture is what I see - on the left hand side, it says [copyright sign] The Authors 2012. On the right hand side, there is a "Permissions" link which goes to Rightslink. The only other copyright related note I see on this page (not in the picture below) is the [copyright sign] Elsevier 2012. All rights reserved. In the actual article, at the very bottom of the article under "licensing information" is the Creative Commons license. The author copyright notice is also there - at the bottom of the page, not co-located with licensing information. A google search for a paragraph within the actual text immediately directs me to this article, which suggests that this Elsevier version of a no-derivatives article is available for text mining. (Details below). Elsevier's Cell Reports has announced that they are offering authors two options for real open access in the form of two Creative Common license options, CC-BY (attribution only) or CC-BY-NC-ND (attribution- non commercial-no derivatives). In both cases, it is the authors that retain copyright, according to the announcement. This is important, as it signifies that with this journal at least, Elsevier is recognizing their obligation to give up commercial sale rights when paid for article production services. However, when I look at articles in Cell Reports, I see copyright (c sign) Authors, and a permissions link - which goes to Rightslink, not Creative Commons. Is Elsevier confused, or is this more pseudo-OA like Elsevier's sponsored articles? One of the benefits of open access is accelerating discovery. This benefit is most evident with libre open access (allowing for re-use and machine assistance via text and data mining), and particularly in evidence with little or no delay from time of discovery to time of sharing of work. Multiple drug resistance: we have developed a range of drugs that has worked for us in the past few decades to combat bacteria, tuberculosis, and other diseases. Now we are seeing increasing levels of resistance to antibiotics and others drugs, including anti-malarial drugs. Maintaining the health gains of the past few decades will take more than continuing with current solutions; we need more research, and the faster we can do this, the better the odds of staving off the next epidemic. Another example of why we need to accelerate discovery, and we need to move to accelerated discovery fast, is the need to find solutions to climate change and cleaner, more efficient energy. We literally cannot afford to wait. So as much as some of us might wish to give current scholarly publishers time to adjust to a full libre open access environment, this is a luxury that we cannot afford. These examples of acceleration will likely provide new business opportunities, too. If this happens, it is a welcome, albeit secondary, benefit. This post is a second reply to a post David Prosser wrote on the GOAL list in response to my post on the RCUK consultation, highlighting the intellectual property issues. This post is a mixture of answers, my perspectives, and questions. In my opinion, David Prosser's brief example raises a number of issues which can help us to move forward with understanding libre open access. In brief, I argue that facilitating data and text mining and resulting works does not involve copyright at all (crawling text and data is simply normative in the context of the world wide web, for example), but rather making works openly available, and in a format that permits text and data mining. Say I wanted to data mine 10,000 articles. I'm at a university, but I am co-funded by a pharmaceutical company and there is a possibility that the research that I'm doing may result in a new drug discovery, which that company will want to take to market. The 10,000 articles are all 'open access', but they are under CC-BY-NC-SA licenses. What mechanism is there by which I can contact all 10,000 authors and gain permission for my research? First, before I comment on intellectual property issues, I would like to point out that the concept of "intellectual property" is a relatively recent invention, and one that arguably should be challenged. For details, see the second chapter of my draft thesis; from here, search for: The invention of “intellectual property”: enclosure of knowledge. Also, a disclaimer that I am a scholar whose work intersects with intellectual property issues, but not a copyright lawyer or expert. Given that the arguably fictional "intellectual property" is legally nonfiction throughout most of the world, following are some reflections arising from David's example. Copyright covers the expression of ideas, not the ideas themselves. If a researcher employed by a pharmaceutical firm were to read 10,000 articles and this research resulted in an idea for a new drug, the pharmaceutical firm would not need to seek permission from any of the authors of the articles in order to apply for a patent. Text-mining is merely an automated form of reading, so again, no need to seek permission from authors to apply for a patent. The World Intellectual Property Organization (WIPO) provides a brief overview of intellectual property which explains well the various forms. In brief, there are about 5 forms of intellectual property, many of which actually have opposing expectations. Patent law is a public declaration of rights to use an idea or procedure, and openness is appropriate. Patent law is designed to protect rights to private profit. Trade secret law is also designed to protect private property, however in this case the protection is achieved through secret, private means rather than a public, open process. Try a google search for: "To pursue, within the limits of the STM Association's aims and objectives, the highest possible level of international protection of copyright works and of the services of publishers in making these works available" and it should be quite easy to find the Introduction to Copyright & Legal Affairs of the International Association of Scientific, Technical and Medical Publishers (STM): http://www.stm-assoc.org/copyright-legal-introduction/ There is nothing on the STM website to indicate that special rights have been granted for text mining. STM is certainly not naive or neutral about intellectual property rights; the founding reason for the existence of STM in protection of IP. Yet clearly Google, a commercial company, is crawling this site and returning results. There is nothing the slightest bit exceptional about this example. This is how the world wide web works! If anyone wants to post things on the web but not make them available for crawling, it is up to the website owner to opt out by indicating that they do not want their site crawled. Some subscription-based scholarly publishers do not allow text or data mining of their databases. It seems likely that they are interpreting the multiple downloads often involved as pirating of their copyrighted content. That is, the basis for refusing to allow text or data mining is interpretation of the activity as a violation of copyright - or fear that the publisher cannot allow text or data mining while simultaneously preventing copyright violation - not because text or data mining actually violates copyright. If publishers' products contain DRM preventing text or data mining, that is a different matter. Legal protection for the publishers in this instance involves DMCA style laws and contract law - not copyright law. Within the context of library subscriptions, data and text mining can be included in contracts. Here is the relevant text from the BC Electronic Library Network model license: 3.1.11 "DATA and TEXT MINING. Members and Authorized Users may conduct research employing data or text mining of the Licensed Materials". This language is not original with BC ELN, but rather developed based on research on other model licenses, including those of JISC, CRKN, and OCUL. In the real world, copying this kind of work with informal permission but without attribution is actually the norm, as we all want to work towards standards and avoid re-inventing the wheel. What is needed to provide for data and text mining, I argue, is not changes to copyright but rather content made available in formats that are easily crawled for these purposes, such as xhtml rather than locked-down PDFs, and made openly available over the World Wide Web. I understand that Europe (as a whole, or just some countries) may have some odd laws that would prohibit text and data mining. This may help to explain why people are trying to use copyright law as a means of ensuring permissions for text and data mining. I would like to know more about this; if anyone can provide details, links, etc., that would be most helpful for all of us to really understand the issues. My first response to David Prosser's question, challenging the underlying assumption that increasing corporatization of the university is acceptable, can be found here. Is the purpose of scholarship private profits? This post is a reply to a post David Prosser wrote on the GOAL list in response to my post on the RCUK consultation. Many thanks for raising this question, David, which brings up a number of interesting points. There is one that I would like to highlight first off as a basic underlying assumption that from my perspective should be challenged. That is the assumption that the increasing corporate involvement in universities is desirable. I argue that it is not. Co-funding of university research by pharmaceutical companies is problematic. What I would recommend instead is reversal of the corporate and high income earner tax breaks brought in, in many countries, over the past few decades as part of the neoliberal ideology*. That way, the public will have enough resources so that universities can be funded by the public to conduct research in the public interest. This would likely need to happen at a global level - an appropriate role for international bodies, from my perspective - to avoid the current risk of capital flight (companies pick up and move to wherever tax rates, employment and environmental standards are lowest to achieve the highest profits) which is undermining western democracy as a whole. 1. Why would pharmaceutical companies want to fund research that might challenge the claims of their successful drugs? 2. What incentive would a pharmaceutical company have to find a cheap or free alternative to their expensive drugs? For example, if a pharmaceutical company is making a lot of profit from selling drugs to combat colon cancer, why would it fund research on public campaigns to encourage preventive measures such as eating vegetables? In the U.K., my understanding is that recent cuts have hit the social sciences and humanities hard. This means universities need to rely more on funding sources such as pharmaceutical companies while at the same time there is less support for this kind of basic, public-oriented research. 3. Should research on the environment be conducted by and for the public interest - or report to the companies responsible for pollution? * Note on neoliberal ideology: think Thatcherism / Reaganism, the idea that the invisible hand of the market will take care of everything, if only we give it free reign. The "invisible hand of the market" comes from a superficial skim of Adam Smith's The Wealth of Nations (superficial because proponents do not speak to Smith's simultaneous call for the strong hand of the state, or the basic underlying assumption of continuous growth, which many would argue is impossible given the real limits of our ecosphere). For more on neoliberalism, I recommend David Harvey's brief and highly readable "A brief history of neoliberalism". We've been giving this a try for four decades, and what are the results? The global financial crisis of 2008, the debt crisis in Greece (and other countries), the Citizens United decision in the U.S. giving corporate money a right to free speech - a significant blow to democracy. It is timely to question this basic assumption, not continue on our current path. First of all let me say congratulations and thank you to RCUK for your continuing inspiring leadership on open access policy. Following are my comments, based on many years of experience in open access policy advocacy, my work as a professional librarian and adjunct faculty at the University of British Columbia's School of Library, Archival and Information Studies, where I have developed and taught courses on scholarly communication, and my doctoral studies (communications, in progress) in the area of scholarly communication and open access. Overall, from my perspective this draft policy introduces two important innovations: reducing the permitted embargo period, and pushing towards libre open access (e.g. allowing use for data and text-mining). In brief, I recommend strengthening the language on shortening embargo periods, and eliminating reference to CC-BY in favor of broader language against restrictions and requiring formats usable for text and data-mining purposes. Also, I recommend that the policy specify immediate deposit, with optional delayed release to accommodate the permitted embargoes. With respect to the embargo period, I recommend strengthening the language indicating that any permitted embargo periods are designed as a temporary measure to give publishers time to adjust to an open access environment, with a view to eventually requiring open access immediately on publication. This language can be found on page 4, I recommend including this in the introductory language to underscore this point. Kudos to RCUK for adopting a leadership position on libre open access. However, I would recommend against specifying the Creative Commons CC-BY license. While many open access advocates understandably see CC-BY as the expression of the BOAI definition of open access, my considered opinion is that CC-BY is a weak license for libre OA which fails to protect OA downstream and will not accomplish the Budapest vision of open access,. My perspective is that the best license for libre open access is Creative Commons - Attribution - Noncommercial - Sharealike (CC-BY-NC-SA), as this protects OA downstream (recognizing that the current CC NC definition is problematic, and noting that commercial rights should be retained by authors, not publishers). As one example of where open access might need such protection, because CC-BY allows for resale of open access materials: if all of PubMedCentral were CC-BY, a commercial company could copy the whole thing, perhaps add some value, and sell their version of PMC. They could not legally stop PMC from providing free access. However, I very much doubt that CC-BY could prevent such a company from lobbying to remove funding for the public version. If this sounds ludicrous and unconscionable, may I present as evidence that just such a scenario is realistic: 1) the efforts a few years ago by the American Chemical Society to prevent the U.S. government from providing PubChem on the grounds that this was competition with a private entity; 2) the Research Works Act, and 3) the current anti-FRPAA lobbying in the U.S., which, similarly to the Research Works Act, claims that published research funded by the public is "private research works" which should belong solely to the publisher. Another reason for avoiding CC-BY is that while the contributions of funders are very important, so are the contributions of scholar authors. Many scholars do not wish to see others who have contributed nothing to a scholarly work sell their work and pocket the money; I certainly don't. For example, Peter Suber recently posted this note to the SPARC Open Access Forum which expresses the distress of an author who published CC-BY in a BMC journal and then found a bogus publisher selling her article for $3. https://groups.google.com/a/arl.org/group/sparc-oaforum/browse_thread/thread/fc977cabd0d59bcc#. The more work that is published CC-BY, the more I believe we can expect to see this kind of scam, and this risks turning researchers off OA. Also, when faculty members develop their own open access policies (e.g. Harvard, MIT), they insist that articles not be sold for a profit. Links to these and other institutional repositories are available through the Registry of Open Access Material Archiving Policies (ROARMAP) at http://roarmap.eprints.org/. To illustrate how CC-BY does not necessarily result in the Budapest open access initative's vision of "sharing of the poor with the rich and the rich with the poor": those who give away their work for commercial purposes may not be able to afford the results. For example, if a scholar from a poorer area gives away their medical articles as CC-BY, images and other elements from these articles could be used to develop point-of-care tools that could be sold at prices that the health care professionals serving the scholar and their families could not afford. That is, despite the best of intentions, CC-BY could easily result in a one-way sharing of the poor with the rich. This is one of the reasons why I strongly recommend that the developing world avoid CC-BY. For practical reasons, to further text and data-mining I would suggest that the article format is more to the point than licensing. An author's final manuscript may be more likely to meet this requirement than the so-called "Article of Record". For example, an author's own version in an open format that allows for text and data-mining, with no licensing language, is much better for text and data-mining purposes than a publisher's "Article of Record" in a locked-down PDF format with a CC-BY license. My recommendation is to specify useable format rather than license. Also, I would recommend against encouraging deposit of the "Article of Record", as scholarly communication needs to evolve beyond the print-based journal article format, and this specification may tend to further entrench a system that needs some shaking up. Regarding p. 5 - working with individual institutions to develop open access funds from indirect costs - good!!! I recommend looking at the Compact for Open Access Publishing Equity http://www.oacompact.org/compact/ for guidance, and for institutions to join. When such funds are developed, it is very important to build in efficiencies to prevent against double dipping, avoid paying excessive costs, and planning for education about the growing pool of open access scam companies is an area that is growing in importance. I differ from some of my colleagues in recommending against funding agencies paying OA article processing fees. What RCUK might want to consider if, similar to North America, some of the publishers experiencing difficulty transitioning are the smaller society publishers, is a journal subsidy program. Canada's Social Sciences and Humanities Research Council has such a program, called Aid to Scholarly Journals. If RCUK does not yet have such a program, that would make it much easier to start up with stronger OA expectations than SSHRC has been able to do to date. Canada also has a program to help scholarly journals transition to the online environment called Synergies which is a good model. In North America, most academic libraries nowadays are providing journal hosting and support services. This sector is by far the most efficient in scholarly publishing, with costs on average less than 10% of the current system. See chapter 4 of my draft thesis for details http://pages.cmns.sfu.ca/heather-morrison/chapter-4-economics-of-scholarly-communication-in-transition/). Finally, a minor point: the introductory paragraph, talking about benefits of open access, appears to prioritize business interest. I fully agree that scholarship and open access to scholarship is a huge potential benefit to business, but would submit that this is not, nor should it be, the main point of scholarship and research. May I suggest that the final sentence of the first paragraph refer to the public first and foremost, and then perhaps speak to business benefits? Many thanks for the opportunity to comment, and best wishes to RCUK in the next stage of your leadership on OA policy.